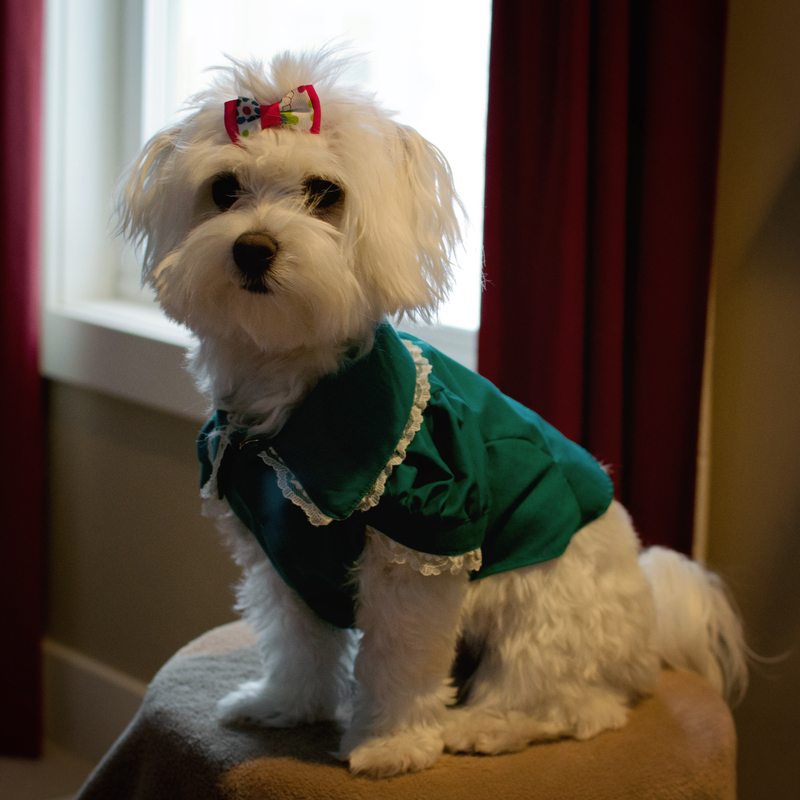 My daughter has spent the last several months begging me to make Lily (our Maltese puppy) a princess dress. We’ve perused countless Etsy websites, sewing blogs, and pattern sites together, looking for just the right outfit. When we stumbled across Julie Ahn’s Facebook page https://www.facebook.com/julie.ahn.129 we were both captivated by her designs. 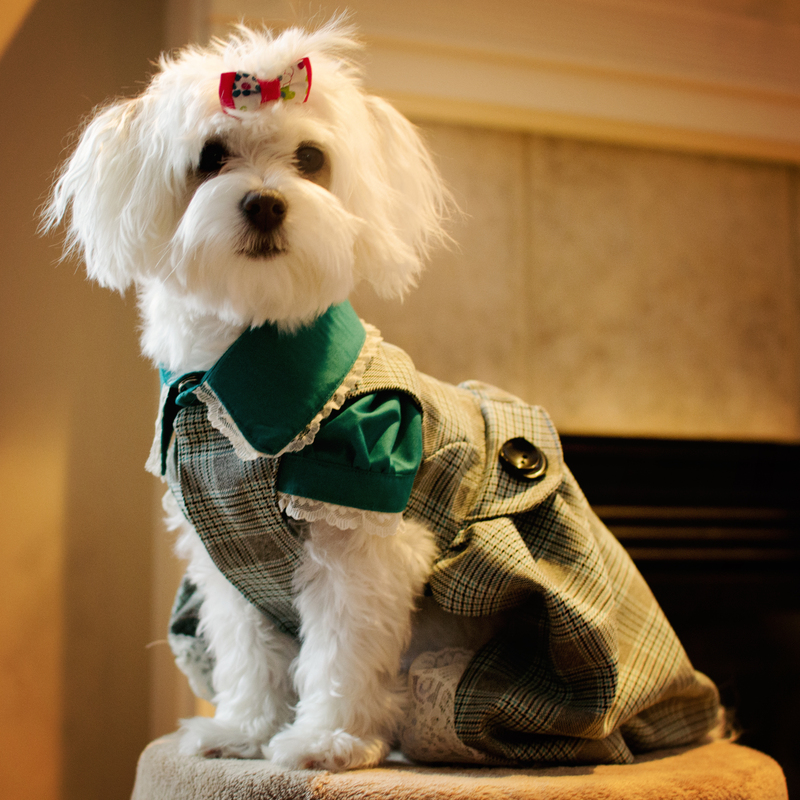 Julie is an incredibly talented Korean artisan who designs the loveliest dresses for small show dogs. My daughter was delighted and immediately suggested that I make Lily an outfit just like hers. The task was daunting but intriguing and I readily agreed. Thus began my research phase. I spent countless hours searching the internet for a sewing pattern that looked something similar to Julie’s outfits only to discover that very few existed. Somewhat by accident, I stumbled across this pattern book on Etsy from Pink Nelie. http://www.etsy.com/shop/PinkNelie. 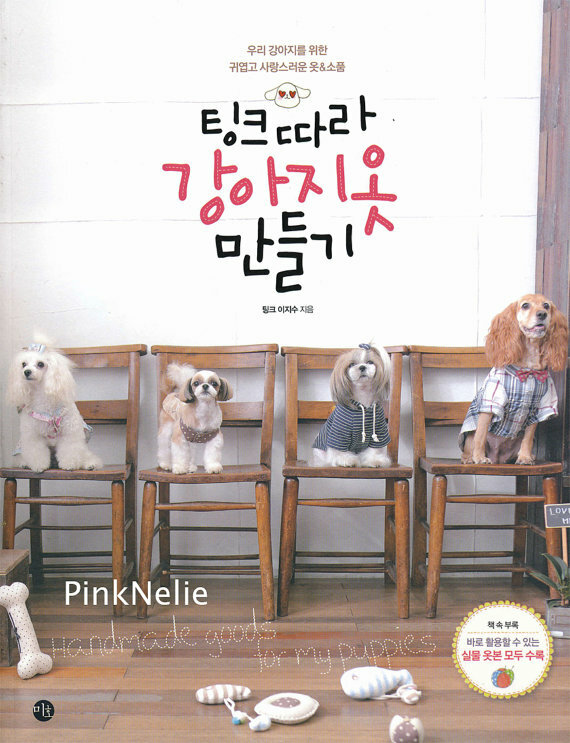 The book, written in Korean, contained thirty dog-related sewing patterns. 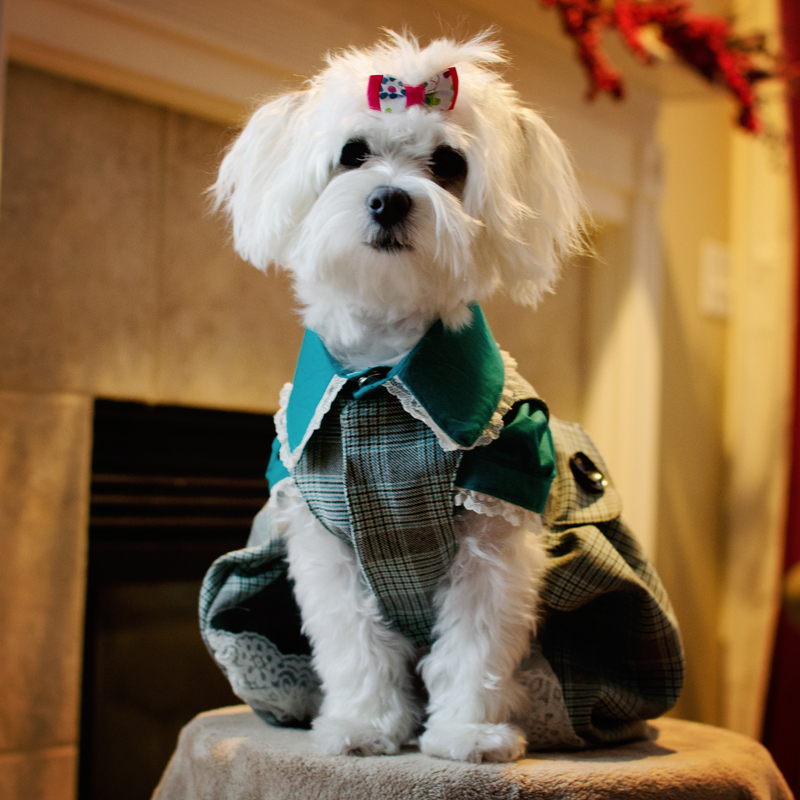 Studying the patterns, I learned how to sew a dog dress. Then I spent a week designing my own pattern pieces to create both a fitted blouse and jumper. Not wanting to spend a fortune on new fabric for a first-time (somewhat iffy) project, I scrounged through my stash and found some beautiful teal stretch cotton for a blouse and matching black and teal plaid for the jumper. And it worked! YAY! Snap closures in the front of both the blouse and jumper make for easy dress-up. Beautiful black buttons adorn the back of the jumper giving the outfit some extra pizzazz. Lace embroiders both the collar and puffy sleeves for an added touch. So did my kids. Their smiles and giggles made the moment special and all the work worth it. Thank-you Connie! Sewing is a fun hobby. 🙂 I do make custom adult hats. I haven’t had anything listed on Etsy in a while – I’ve been too crazy busy – but if you or someone else is interested, e-mail me at janna@vanderveen.com and I can figure something out. Wow! You are talented! Looking forward to seeing more of your items!! Any adult hats? Cute, stylish and keeps sun off face?! haha!!! I can’t wait to see the pink outfit!!! 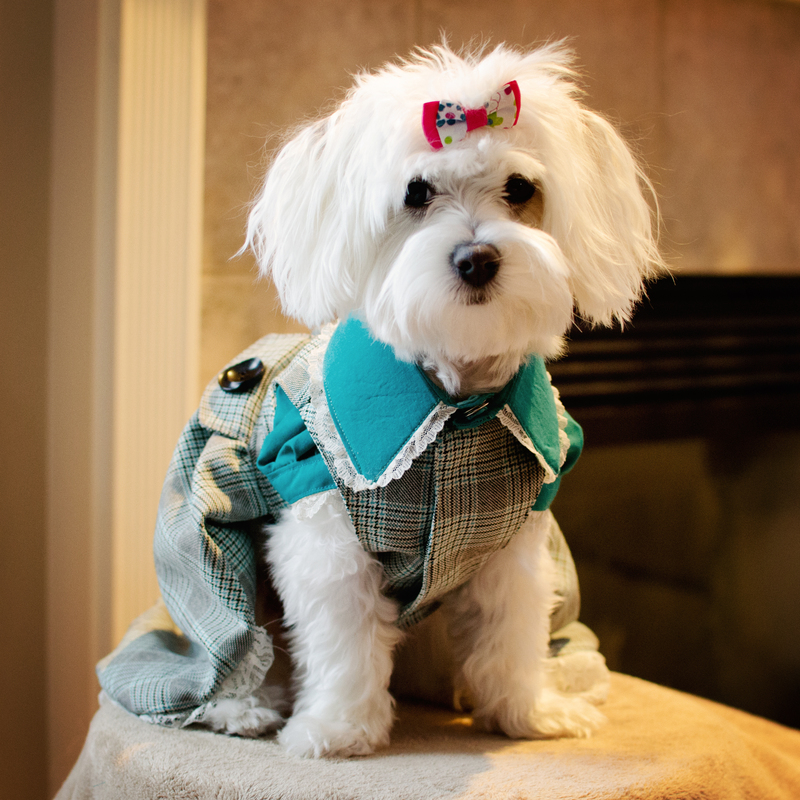 Very cute-the outfit and the dog. Lily is a very good model. Janna, Lily looks so cute! I love this blog! You did it. The blouse and jumper are very cute. Looks like it was a lot of fun. Lily was probably more cooperative with fittings, etc, than human kids would be.